How's everyone's day going? I'm on training this week and will need to keep my posts short so nails are going to feature prominently as they are quicker to write up. This is the latest nail colour I have on while I'm on Life Cycle Management training this week (they should have this course on people rather than systems, would be so much more interesting). 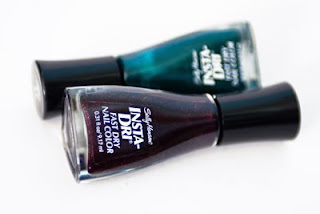 Sally Hansen Insta-Dri dries any nail colour in 30 seconds for no fading or chipping for up to ten days. The non-oily formula dries colour and shields manicure from fading and discolouring with superior shine. In natural light, it is a deep purple-plum colour, but indoors in florescent light, it is more a eggplant purple. It is gorgeous under the sun and looks very edgy accesorised with grey/black clothing. This shade would suit all skintones. Semi creme, leaning more towards a satin finish. 1 coat yields a rather flat colour while 2 coats gives a more glossier look. I would have preferred the promised superior level of shine, but the shine level achieved was just average. Easy to apply formula that resists streaking, is self-levelling and helps hides bad application well (all things I look for in my nail lacquers). It is also non-staining upon removal - another good sign. The only let down for me is the rather small bottle opening. I often find I'm not getting the flattened brush into the the opening and instead wiping polish onto the side, annoying when excess polish is dripping down from the stick end of the brush and I can't can't wipe it away quickly enough back into the bottle. Staying power was above average - there was minimal fading on the edges the next day and this was despite not having applied a top coat. 2 coats in natural light. No topcoat. Rating: 7.5/10. Would have preferred the bottle design to be the conventional round or square shape rather than triangular with a small opening. More gloss to the finish would have been great too. RRP A$13.95/US$4.99 for 9.17ml at all good pharmacies and Priceline in Australia. I have one in fuchsia. Love the colour and consistency, but hate the brush. It's too big! Same - great product but not so good packaging... hope they fix this up and re-package it soon.